Descendants of the god Ares and nymph Otrera, the Amazons were blessed with strength, longevity, and mystical powers. As their divine bloodline was weakened by mating with humans, they learned to focus and maintain their powers through the use of body decoration, mainly tattoos. Despite their descent from Ares, the Amazons worshipped Artemis, the goddess of the hunt, forests and hills, and womanly concerns of virginity, fertility, and childbirth. As the world outside of their community moved to worship gods over goddesses, their desire to stay separate--and exclusively female--grew. Dividing eventually into twelve tribes each identified with a protector animal, the Amazons lived in the area around what we now call the Black Sea for centuries. Then the ancient Greeks encountered a few of their settlements. Their stories of a tribe of woman warriors began to draw the interest of the outside world. To survive, the Amazons became increasingly nomadic. 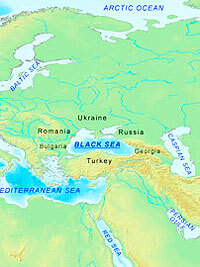 Although they dispersed in all directions, most moved into the steppes of Russia. The animals that had identified their settlements became family totems, a reminder of their past greatness. These totems were tattooed on each member of the tribe, tying them together magically when they weren't together physically. Such a tattoo became known as a telios. Amazons fall into four basic talent groups: warriors, priestesses, artisans, and hearth-keepers. Amazons may have aspects of power from all of the groups, but there is usually one that is obviously dominant. Their personal power tattoo (the givnomai) is chosen to enhance those powers, helping to lock them into their role for the tribe. It is rare for an Amazon to have significant powers from more than one group. Warriors possess superhuman strength and flexibility. Priestesses can harness elemental powers--fire, wind, water, earth--without use of objects. 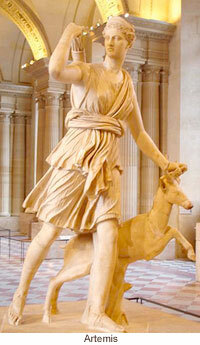 Priestesses also call upon the goddess Artemis for guidance for the tribe. Artisans create objects that store power: tattoos, fetishes, jewelry. The power these objects have is based on what they represent--a bear fetish would provide strength, a coyote stealth, a fox cunning. Some artisans can put the power into the object; others can only create the object and must have assistance from a priestess to embed the power. Home, food, and childcare are provided by the hearth keepers. Their powers are protective and medicinal. Although not immortal, Amazons do live for hundreds of years and retain a youthful appearance for several centuries. Even in the New World, the Amazons kept their nomadic ways. The twelve tribes continued to keep a low profile by traveling around the country, much like modern-day gypsies, settling for short periods of time in one of six "safe camps." Camps are located on enough land to provide a buffer between them and the human world. Each has a hearth keeper, priestess, and queen (from the warrior talent group) assigned to them by the high council. These queens maintain order within the camp and work to protect it from human detection through both magical and mundane ways. They stay in one place longer than others, but still shift to a new camp every few years. Individual Amazons move freely between these camps, never settling down for too long. Amazons mingle with the human population on a limited basis. Just like their ancestors, they take human lovers, but do not marry. Since most Amazons believe themselves superior to humans, most have no issues with stealing from humans or conning them out of money. Their semi-nomadic lifestyle aids them in evading confrontations that might come from such an existence. A few do offer legitimate--or semi-legitimate--services at area fairs and bazaars such as selling craft items, like fetishes and jewelry, telling fortunes, or offering self-defense classes. They do not, however, take jobs that require them to work day-to-day in one place, or get to know any humans in depth. If anyone begins to get too close, they move on. The Amazons have never trusted men, nor brought them into their camps. They even feared their own male offspring might rise up and try to control them as Greeks males had tried in the past. Because of this fear, their male children were put to death. Over time they stopped the killing and instead maimed the infants by breaking an arm or leg, and leaving the boys where humans could find and raise them. Around the turn of the nineteenth century, Bubbe Saka, a priestess, was instrumental in stopping all of this. Male children thereafter were left unmaimed at human churches and hospitals. Although the Amazons were unaware of it, even before the maiming stopped, these sons had begun gathering together. Also unknown to the Amazons, their sons possessed similar powers to their own. Through an encounter (told in Amazon Ink) with Melinappe ("Mel") Saka--Bubbe Saka's granddaughter and an Amazon who had left the tribe--the Amazons discovered both the sons' existence and their powers. For the first time in their history, they are forced to face the fact there is a group who can match them power for power.